A year ago, a fertilizer plant in West, Texas, caught on fire. As volunteer firefighters rushed to the scene, the 30 tons of ammonium nitrate stored in wooden bins exploded. What have we learned from this disaster? Nothing. Fifteen people died (most of them firefighters), at least 160 were injured, hundreds of homes and buildings (including a senior center and a school) were leveled or ruined and $100 million of damage was done. The explosion left a crater 93 feet wide and 10 feet deep. In the immediate aftermath, there was a lot of talk about how this could have happened: who, if anyone, was responsible? Where were the safety regulations preventing something like this from happening? Why were residential buildings allowed to be constructed so close to a potentially dangerous fertilizer plant? How can this be prevented from ever happening again? A year later, we still don't have the answers. We don't even know what caused the fire. The United States Chemical Safety Board is still investigating. Preliminary findings note the lack of a sprinkler system in the plant and lax or conflicting regulations for the storage of ammonium nitrate -- most of which haven't been updated in decades. There is no one state agency that actually has oversight or regulatory power. 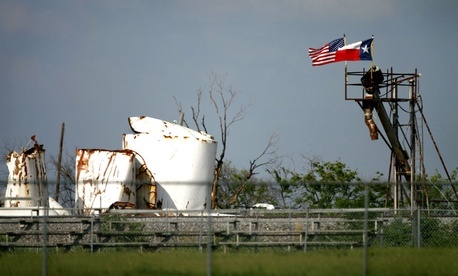 Not only that, Texas has precious little knowledge about what is occurring inside its fertilizer and chemical plants. Since the accident, several legislative proposals have been put forward for consideration when the part-time Legislature reconvenes next year. But Texas has one of the most conservative, anti-regulatory legislatures in the nation. Republican Rep. Joe Pickett, chairman of the Texas House Committee on Homeland Security and Public Safety, says any proposal that would give the state a lot more regulatory authority just isn't going to fly. Fire codes have some useful provisions for ammonium nitrate. But they need significant revision to strengthen the storage requirements for AN. Even if they were revised, we note that Texas and most of its counties have no fire code. So at West, these fire code provisions were strictly voluntary, and West Fertilizer had not volunteered. Almost a year later Texas and its rural counties have not adopted a fire code. As for penalties, the plant was cited for 24 OSHA violations and fined $118,300 in October. OSHA might have seen some of these violations prior to the explosion if it had seen fit to inspect the plant, but it hadn't since 1985. The fines will punish the plant's owners for what happened before, but do nothing to ensure it won't happen again. A joint investigation between the Texas fire marshal's office and the ATF is "active and ongoing," but officials wouldn't tell CNN anything more than that. Lawsuits filed by the explosion's victims are winding their way through the courts, but even family members of those killed told the AP that they just wanted to move on because "being upset at everyone involved is not going to bring anyone back." It won't, but it could prevent more from being killed. West mayor Tommy Muska recently proposed building a new fertilizer plant to help boost the town's economy. This time, he said, "we need to have it safe." Too bad there's nothing forcing the proposed plant's owners to comply.